The luminaria all have a ground area of around 1000m2/ 10,000ft2, they are modular to adapt to different sites, easy to install and can operate in most weathers. The appearance of these ephemeral cathedrals of air is always a dramatic intervention in the everyday environment. 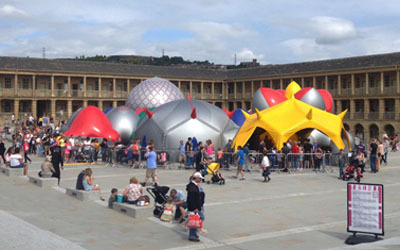 A luminarium is found in a great variety of contexts: festivals of music, theatre, science & dance, at arts centres & museums, at community, corporate & school events, architecture & design related events, etc. The luminaria are also presented as a stand-alone event e.g. as part of a civic summer programme. An exhibition may typically last from 3 to 30 days and up to 2000 visitors per day may pass through the luminarium - to come out delighted with wonder at the beauty of light and colour. THE BROADEST APPEAL - a luminarium is for everyone. Appreciated by all ages, all cultures, all abilities. A luminarium is the most inclusive offering. A POWERFUL MAGNET – the visibility of AoA’s luminaria often makes them a centrepiece to a festival and a huge magnet to attract the public passing by. GREAT MEDIA COVERAGE - the luminaria are enormously photogenic - front-page photos in the press and an avalanche of online social media is typical. Most exhibitions will attract TV coverage and often live broadcasts. UNIVERSALITY - luminaria have been exhibited above the Arctic Circle and in the desert, in daytime and at night, indoors and outside, in the heart of the city and on a mountainside. VERSATILITY - Most often the luminarium is enjoyed simply for itself – but sometimes it has played host to complementary animations and marvellous performances. PROFESSIONAL SERVICE - AoA has built a solid reputation for reliability over 25 years of international touring whilst maintaining a 100% safety record. That a third of bookings are requests to return is testament to the success that a luminarium delivers. STRONG SPONSOR APPEAL- offering a wide range of possibilities for publicity and hospitality, a luminarium can be a great platform for raising a sponsor’s visibility. Setting up the luminarium may take 1 or 2 days depending on the technical requirements of the installation. The ideal site may be chosen for its visibility, ease of visitor access, good drainage, suitability of surface. 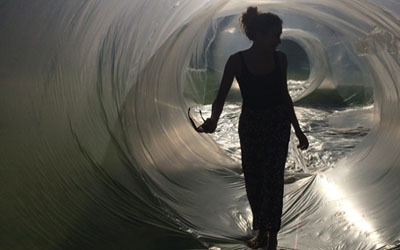 Once installed, the luminarium is inflated for the hours of opening to the public and is deflated overnight. The luminarium may stay open after sunset when the presenter installs lighting outside. The luminarium can also be lit inside as a giant lantern to be viewed from the outside. The luminaria are modular and can be configured to adapt to different site dimensions. The luminaria are generally enjoyed in temperate weather but have been exhibited in cold weather down to -10°C and in warm weather up to 40°C. Each luminarium has been evaluated by independent structural engineers and has its own comprehensive safety manual. The presenter provides crew, barriers, security, power as well as furniture for the reception area. Depending on site surface, anticipated temperatures and opening times after sunset there may be an additional requirement for anchorage, flooring, air-conditioning or heating and lighting. The average attendance of a luminarium is 900 to 1,000 visitors per day. Capacity is up to 80 visitors at any one time with up to 250 visitors per hour at peak times. An average duration of visit is around 15-20 minutes but visitors who wish may often stay inside indefinitely. The presenter provides a team of 8 to 11 stewards to welcome the visitors. A reliable, fit, enthusiastic team of stewards is key for a successful event. Opening hours average 6,9 or 12 hours per day with last admission 30 minutes before sunset. For admission after sunset the presenter will provide lighting. The admission charge is set by the presenter and is typically around £4, $5, €5. Infants up to 2 or 3 years usually have free admission. An adult must accompany children under 16 years. The presenter is responsible for the marketing of the event and for providing clear signage and information to the visitors. Generally a luminarium is enjoyed simply for the experience itself but the luminaria can also be a wonderful setting for a range of performances and workshops. By its nature a luminarium gives access to a very broad audience. 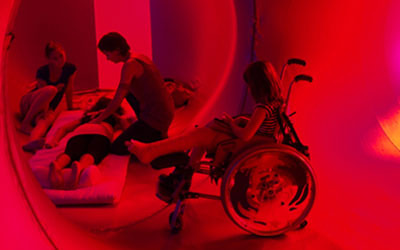 The presenter is required to promote the luminarium’s accessibility, especially to wheelchair users. If you are interested in receiving information about booking Architects of Air please take a moment to complete this form. AoA is keen to promote the skills of inflatable design and construction and has the experience and resources to propose short and long-term hands-on build workshops aimed at goups of 10 to 100 people who are interested to explore the principles of pneumatic architecture through creative teamwork in the building of inflatable structures. The workshops can be held to enhance a luminarium presentation or as a stand alone workshop. Accessibility & inclusivity to the widest audience is central to the work and AoA seeks to develop collaborations with hosts interested to promote social inclusion and integration of people with disabilities in the wider community. 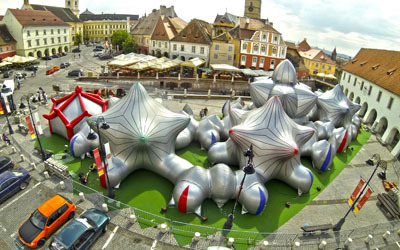 A luminarium also lends itself to meetings and workshops that might also interest the more corportate type events.